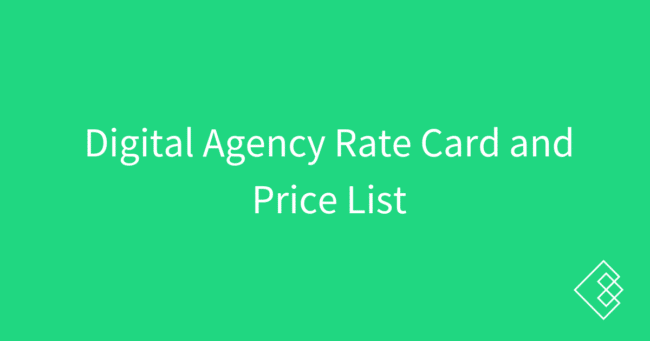 Something we often get asked for is an agency rate card, otherwise known as a price list. The reality is that such a thing does not exist across the industry because every agency or consultant charges different prices for different services. Strategy tends to be more expensive than services, but both can be lumped under the same term such as “SEO”, though these should more often be broken out as “SEO consulting” and “SEO services” depending on what is being done. Buying digital marketing services on the high end is like shopping for a new car. You (probably!) don’t walk into a dealership, see a car for $45,000, and say “I’ll take it”. Instead you look at its miles, its ratings, its reviews, and ultimately you haggle on the price a bit. Ultimately, there is some salesmanship involved. On the low end, you might be willing to just pay $2,500 for a car unseen if you want a clunker or don’t care how long it lasts. But you’re getting what you’ve paid for. That said, we can absolutely get a high-level view of how much agencies and consultants charge for digital marketing. This encompasses both strategy and services. Throughout the rest of this guide I have also broken down the different areas of digital marketing and how pricing changes for those specific channels, so be sure to check out the other chapters as well. Without further ado, here is the digital agency rate card and price list as gathered from our 271 survey respondents. 1 Demographics	This chapter outlines the demographics of the survey respondents. 2 SEO agency and consultant rates	The rates for SEO agencies and consultants from the digital marketing industry pricing survey. 3 PPC agency and consultant rates	The rates for PPC agencies and consultants from the digital marketing industry pricing survey. 4 Facebook advertising agency and consultant rates	The rates for Facebook advertising agencies and consultants from the digital marketing industry pricing survey. 6 Digital marketing agency and consultant hourly rates	These are the hourly rates for digital marketing agencies and consultants from the 2019 survey. 8 Takeaways	These are the main takeaways and quotable insights from the 2019 digital marketing pricing survey.